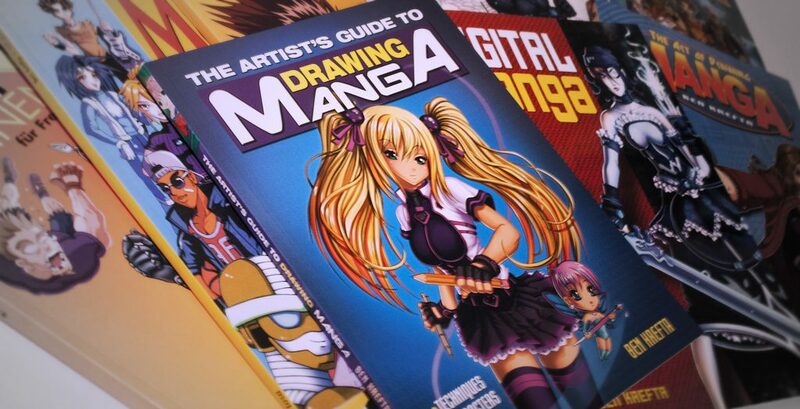 My latest tutorial book The Artist’s Guide to Drawing Manga is now available for humans to buy. It primarily covers basic to intermediate techniques for creating manga style characters and artworks. I’d been wanting to create a new replacement to my first book The Art of Drawing Manga, and managed to revamp every aspect of it. The written content was doubled, the artwork quality increased, the tutorials and examples more relevant and the book’s layout upgraded. The Artist’s Guide book was designed to compliment Digital Manga– a book which details the digital process in more detail. Instead of learning manga, shouldn’t I be learning fundamentals to improve? The book’s ultimate aim isn’t to force students to replicate stylized versions of people. It’s main aim it to ask students to consider things like: using guide lines, basic shapes to plan proportions, how to break down complicated images into easier to understand sections, to sketch before refining details, to think about how to visually communicate by adjusting a character’s pose, expressions, actions, clothing and also hone in on what makes the anime style so special and unique. Yes, spend time life drawing and studying the real world. Learn to draw all sorts of things- not just manga, but if you want a book to motivate you to try out some artistic ideas in a style you appreciate, or even if you just want to draw a few manga characters for fun, consider the Artist’s guide to be your manga-flavoured medicine. I have a lot of faith in the book… I know what I’m talking about, having created manga inspired artwork for years for dozens of clients. Check out my portfolio- I’m teaching readers how to achieve a similar vibrant and professional look to their artwork. I’m no stranger to creating ‘how to draw manga’ books- I have refined my process of communicating my knowledge over the last decade and put together a package which will advance one’s ability much quicker than if they were to try pulling tutorials from various sources online. Art still takes a ton of time and practice to get better, but if my 1000s of hours of instructional book-writing experience can bring a reader’s skills up a notch or two for a reasonable price, I’d like to think that’s worth it. Online tutorials can be a bit hit and miss. I spent days researching what’s already online. And while there is some excellent stuff, it can be hard to find and there’s also a lot of confusing, poorly written instruction out there. All these tutorials are scattered across the web in various locations while The Artist’s guide to Drawing Manga houses 124 pages of info in one place. – That info has consistency. It’s written by the same author, so you know you wont be getting confused by trying to follow different ways of doing things from different teachers. Even if you read a lot of tutorials and have other art books, there’s always room for another. I’d be very surprised if a reader didn’t learn at least one new, useful technique from the book. If that one technique saves hours of time and trial and error, isn’t that worth paying for?